Romney’s bullying: How bad was the “vicious” incident reported by the Washington Post? Remembering the incident, one witness told the Post, “to this day it troubles me.” Another called it “vicious.” Friedemann said he feels badly he didn’t try to stop it. A fourth witness ran into Lauber at an airport bar three decades later and apologized to him. He says Lauber responded, “It was horrible,” and “It’s something I’ve thought about a lot since then.” Lauber, who was later expelled from Cranbrook for smoking a cigarette, eventually came out and lived a “vagabond” life, according to Horowitz, who spoke with Lauber’s sisters. He died in 2004. Let’s assume that the details five other people (most but not all of them Democrats) keenly recall are true. How bad is this, as an example of bullying? Was this just the sort of thing that went on at boarding schools in the 1960s? Or does it show a troubling lack of empathy on the part of Romney? The short answer is that it’s both. In lashing out at kids who were perceived as effeminate, Romney wasn’t alone. Horowitz recounts that when Romney shouted “Atta girl!” at another closeted gay student who tried to speak up in English class, he was using language of the sort even teachers employed. Kinsley says that’s plausible but not typical. Technically speaking, the Post account doesn’t make Romney a bully. The academic definition of bullying is verbal or physical abuse that involves a power imbalance and that’s also repeated. We don’t have evidence that Romney went after Lauber more than once. But given the nature of the incident, it may be splitting hairs to absolve him of bullying. As the child abuse expert David Finkelhor has written, one-off acts of cruelty can also count as serious peer victimization and are very much worth addressing. If Romney was a high school student who did this today and got caught, he’d be punished, and for good reason. In retrospect, the idea that he got away with this act of cruelty while Lauber ended up kicked out of school for smoking seems unjust. It’s telling that decades later, Lauber remembered the hair-cutting and said he’d dwelled on it. Though it seems to have been a lone act, it was one that could well have had a lasting effect: Lauber would have had to walk around shorn afterward, marked for everyone to see. And even if Romney didn’t see the incident as anti-gay, that subtext is significant for thinking about the impact on Lauber. LGBT students are still more likely to be bullied and victimized by other kids: In a 2009 national survey, 85 percent of kids who identify as LGBT said they’d been verbally harassed at school, 40 percent physically harassed, and nearly 20 percent physically assaulted because of their sexual orientation. The consequences have been laid out by researchers: Boys who are targets have higher levels of anxiety and depression. For girls, being taunted as a lesbian is linked to social withdrawal. Students who are harassed because of their sexual identity miss substantially more school and, in one study, earned lower grades. And in a study of young gay adults between the ages of 21 and 25, the ones who reported being bullied frequently in middle school and high school were over five times more likely to say they’d attempted suicide than the ones who hadn’t been victimized. Romney, of course, wouldn’t have known any of this in 1965, and it’s not fair to hold him to today’s standard of awareness. The idea of homophobia wouldn’t have existed at Cranbrook then, Kinsley says. But it is fair to ask what rounding up a bunch of other students to pin a kid down and cut off his hair says about Romney’s sense of empathy. At that moment in time, he showed a startling lack of fellow feeling for John Lauber. This is the aspect of bullying I’ve found most disturbing, in my reporting on it. Experts say that when a powerful kid turns on a weaker one the way Romney did, he can experience a chilling cognitive shift, and come to see his victim as worthless. For a small number of kids who bully, this state of mind hardens, and they become people who can inflict pain without feeling compassion or remorse. Luckily, that is exceedingly rare. Most kids are pitiless one moment and then soften the next. Surely we can put Mitt Romney into this category. This high school incident of cruelty doesn’t mean that he is a cruel person. At the same time, it does give the lie to this statement from his spokesperson: “Anyone who knows Mitt Romney knows that he doesn’t have a mean-spirited bone in his body.” However true that may be today, like plenty of other people, Romney did reveal a mean streak in adolescence. As a teenager, he apparently saw a kid who didn’t conform to his idea of normal and went after him, cruelly, methodically, and aggressively. 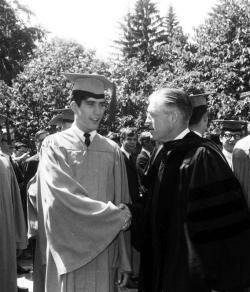 It’s not surprising that Romney would have been a straight-laced, by-the-book kind of student who policed gender norms, to use the parlance of our time. But it is surprising that he was such a jerk about it. 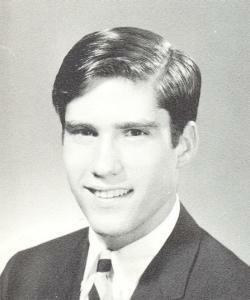 It’s also worth pointing out, as Salon’s Glenn Greenwald has, that as a Yale sophomore in 1965, George W. Bush reportedly stuck up for a reputedly gay student. Bush heard the student being called “queer,” told the taunters to shut up, and apparently also said, “Why don’t you try walking in his shoes for a while?” That’s the kind of instinctive compassion Mitt Romney failed to show when he was a few years younger than Bush was.